Creative and dedicated photographer and photo editor with experience in still imaging industry since 1997 including photojournalism, fashion, events, food and product photography...Read moreCreative and dedicated photographer and photo editor with experience in still imaging industry since 1997 including photojournalism, fashion, events, food and product photography - commercial fine art photography. 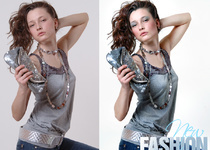 I am expert in digital photography and image postprocessing with proven history of meeting client objectives for final photographic products while also improving the efficiency of the editing process. Logo & Branding Pack Premium Design for Your Business/Company. Eleonora always produces excellent work! Elanora provided great service in good time. Her photo editing skills has made our product look very attractive. Would highly recommend. Had a 2nd project with Eleonora and she is amazing talented person, work accomplished on time with the same professional and outstanding service. Superb. I would highly recommend Eleonora.